Abuja, Nigeria. January 10, 2013 – In a recently conducted New Year poll Nigerians have urged President Goodluck Jonathan to focus on addressing unemployment, electricity supply, insecurity and corruption in 2013. 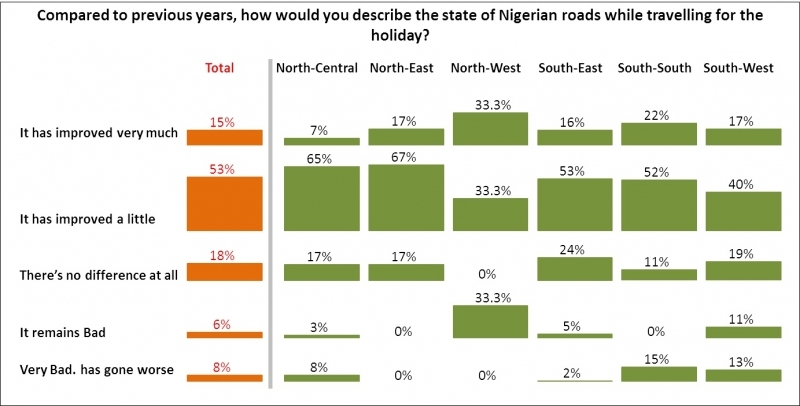 The poll which sampled over 500 Nigerians across the six geo-political zones also revealed that despite the heavy gridlocks experienced on major highways during the Christmas and New Year season, about 53% of the respondents were of the opinion that there has been slight improvement on the current state of the roads in the country compared to previous years. These were two of the key findings from the poll conducted by NOI Polls Limited, an Abuja-based opinion polling and research organisation. Respondents to the poll were asked five questions to ascertain their experience during the Christmas and New Year season and the policy direction they will for 2013. The first question was: How was your Christmas and New Year holiday? To this question, a slim majority 32% said “it was ok”, while 31% each said it was “enjoyable” and “very enjoyable” respectively. A meagre 5% and 1% said it was “not enjoyable” and “not enjoyable at all” respectively. 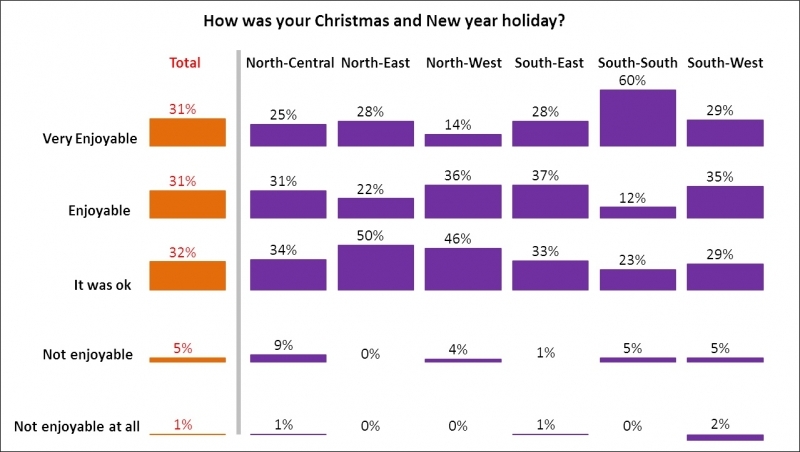 Overall, the results show that at least 3 in 5 Nigerians (62%) seemed to enjoy their Christmas and New Year holiday. Interestingly, when analysed further across geo-political zones, the results show that the South-South zone has by far the highest proportion of respondents that claim their holiday was very enjoyable (60%), and this may be explained by the series of carnivals, festivals and events organised and sponsored by state governments within the region such as the Calabar Carnival (1st – 31st Dec.), Port-harcourt Carnival, Carniriv (10th – 15th Dec.), and Ibom Christmas Carnival (22nd Dec.). To the second question, Did you travel for the Christmas and New Year holiday?, the majority (62%) of respondents said they did not travel. However, almost 4 in 10 respondents (38%) said they travelled. To the respondents that travelled, the third question was a follow-on which asked: Compared to previous years, how would you describe the state of Nigerian roads while travelling for the holiday? In response, the vast majority of the respondents (54%) said the state of the roads “has improved a little”, while 18% claimed there is “no difference at all”. This is followed by 15% who said the roads have “improved very much” and 8% who said it is “very bad and has gone worse”. However, only 6% claim that the roads “remain bad”. Overall, 68% of respondents were of the opinion that the roads have either improved very much or improved a little, while only 14% thought that the roads have remained bad or gone worse. Furthermore, when analysed across geo-political zones, it was revealed that the North-East (67%), followed closely by the North-Central (65%), South-East (53%) and South-South (52%) zones all had high proportion of respondents who thought that the roads had improved a little compared to previous years. Moving forward, the fourth question sought to appraise the state of security in the country during the festive season. Respondents were asked: How would you describe the state of security where you spent the holiday? In response, an overwhelming majority of the respondents (70%) said it was peaceful and secure. This is followed by 21% who said it was peaceful but not secure. A meagre 5% said it was tense and insecure, while 1% gave other responses. Consequently, given the high proportion of respondents that thought their location was peaceful and secure during the Christmas and New Year holiday, it is worth commending the Nigeria Police Force and other security agencies for their unflinching service and dedication towards ensuring peace and security. Interestingly, when analysed across geo-political zones, the South-South had the highest proportion (80%) of respondents who thought their location was peaceful and secure; followed closely by South-East (75%), and South-West and North-Central (70% each). On the other hand, the North-West had the highest proportion of respondents (57%) who thought their location was peaceful but not necessarily secure; while only 33% in the North-East declined responding to the state of security in their location. Although there isn’t a clear indication as to why respondents within these two regions feel this way; perhaps, it may be linked to the few reported Christmas Eve attacks in Kano, Yobe and Borno states. 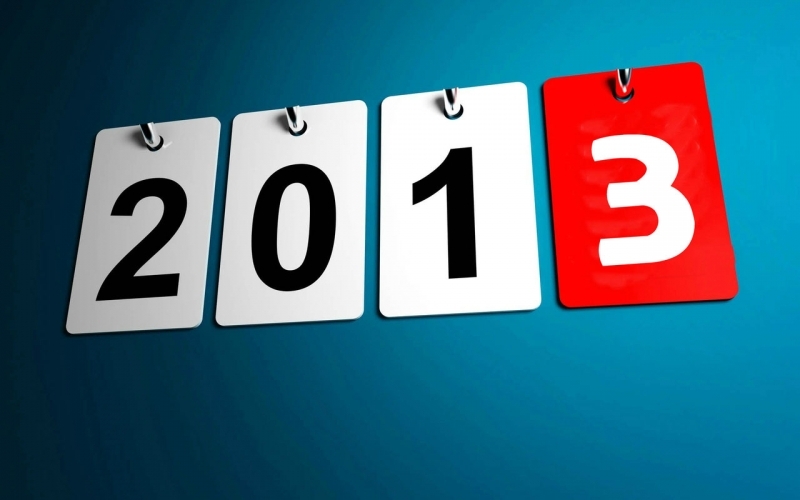 Finally, the last question gave Nigerians an opportunity to chart a course for the policy agenda in 2013. 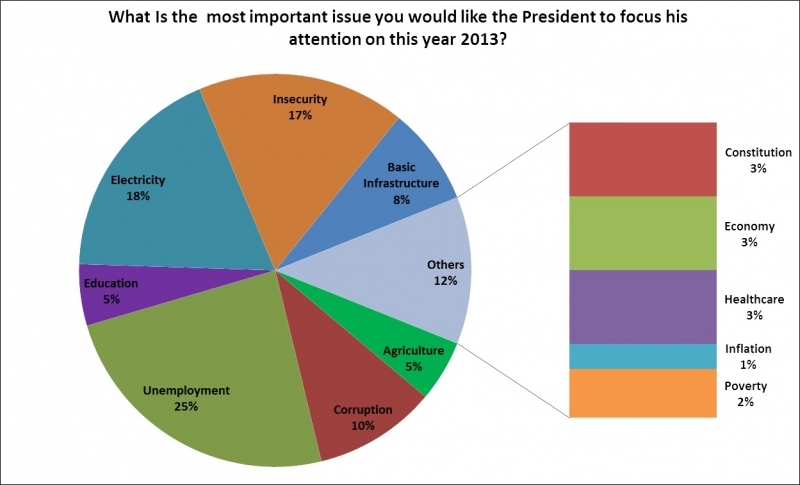 Respondent were asked, What is the most important issue President Jonathan should focus his attention on this year 2013? 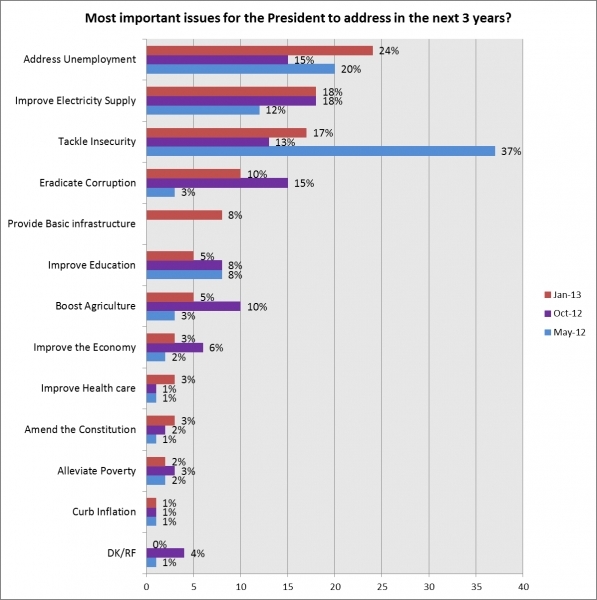 From the results, the majority of respondents (24%) were of the opinion that the most important issue the President needs to focus on is addressing unemployment. This is followed by improving electricity supply (18%), tackling insecurity (17%) and eradicating corruption (10%). Furthermore, 8% talked about improving basic infrastructure, while 6% talked about improving education, and 5% mentioned the boosting of agriculture. A paltry 3% each mentioned the economy, health care and constitution; while 2% mentioned tackling poverty. Furthermore, when compared with the responses gathered during the Special Democracy Day Poll in 2012, the four most important issues that Nigerians wanted the government to address at the time were – Insecurity (37%), Unemployment (20%), Electricity (12%), and Education (8%). Similarly, a subsequent Independence Poll conducted released in October 2012 revealed that the most important issues at that time were – Electricity (18%), unemployment (15%), corruption (15%) and insecurity (13%). In conclusion, a common thread that runs across the three polls trended is the fact that the most salient issues that Nigerians want President Goodluck Jonathan’s administration to address between now and 2015 are: Unemployment, Power and Security. The administration should also be seen tackling corruption institutionally at all levels.